February 16 marks 9 months of continuous operations on orbit for MinXSS-1. It has collected and downlinked tens of thousands of soft x-ray from the Sun in that time. We’ve published first science results in The Astrophysical Journal and have more in the works. We’ve also been publishing engineering papers on a variety of topics. See the publications list on this site for a full and continuously updated list. The altitude continues to decrease due to drag but as yet, the attitude control system has had no trouble maintaining accurate pointing despite the increasing drag it has to compensate for. 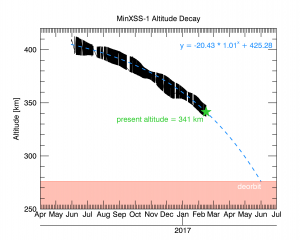 The Joint Special Operations Center that tracks all objects in space has estimated that MinXSS-1 will de-orbit (i.e., burn up in the atmosphere) in late May. If that’s true, MinXSS will have been on orbit for just over a year. That’s really good for any CubeSat!